- New Day opened the show. They ran down The Rock because he didn't hold any championships. The Miz came out and agreed with them, and said Rock had disrespected him, and he's a fellow movie star. The Usos came out and ran down Miz. The New Day said that the Usos were riding Cousin Dewey's coattails. Then Titus O'Neil & Dolph Ziggler came out and we had a match. - Usos & Ziggler & O'Neil beat WWE Tag Team Champions The New Day & Miz. O'Neil pinned Miz with Clash of the Titus. - U.S. Champion Kalisto beat Neville to retain. Good match with a Salida del Sol finish. - Chris Jericho was out for the Highlight Reel. He talked about his match with Styles on Raw and said had two of the Fast Lane main event participants on the show. Dean Ambrose and Roman Reigns came out. 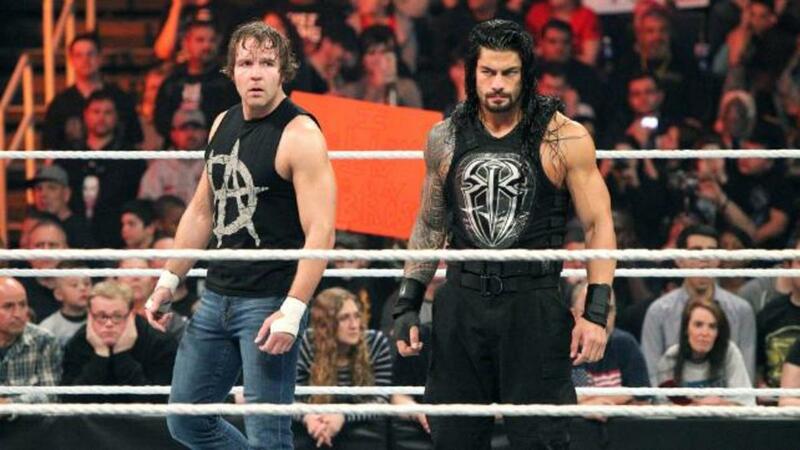 Ambrose was cheered and Reigns had a mixed reaction. Reigns said how he and Ambrose started their career in a warehouse in Tampa. (Didn't Ambrose start in Cincinnati?) Jericho tried to stir things up. They both put over that Brock Lesnar was a monster. Reigns told Ambrose that he's never been able to beat him before so good luck. The Wyatts then came out and talked about what they did to Lesnar in the Rumble. Wyatt challenged all three to a six-man tag for the main event. - A.J. Styles beat Curtis Axel with the Styles Clash in a short match even though the other Social Outcasts interfered. - Divas Champion Charlotte beat Natalya in a non-title match. Quick match. Becky Lynch made the save when Charlotte attacked Natalya after the match. - Sasha Banks, Tamina and Naomi were backstage taking about Banks going after the title. They teased the idea they may be splitting up down the line. - Chris Jericho & Dean Ambrose & Roman Reigns beat Bray Wyatt & Luke Harper & Erick Rowan via DQ. Strowman interfered. The Wyatts were beating up on the faces until Big Show came out. They all beat down Show until Jericho & Ambrose & Reigns recovered and cleaned house.